Resource Prospector (RP) is an In-Situ Resource Utilization (ISRU) capability demonstration mission currently planned to launch in 2020. Expanding human presence beyond low-Earth orbit to asteroids and Mars will require the maximum possible utilization of local materials — so-called in-situ resources. RP aims to be the first mission to validate prospecting, extraction, and analysis of planetary surface resources for the express purpose of resource utilization. The RP mission plan would include finding water, extracting it, processing it and storing it. In addition to ISRU validation, RP will be capable of characterizing the distribution of water and other volatiles at the lunar poles, enabling innovative uses of local resources. This capability will inform the exploration of near-Earth asteroids (NEAs) and Mars, as well as the selection of future mission destinations, and could reduce the risk associated with human exploration. Through Resource Prospector, NASA hopes to determine if lunar resources can be harvested to support future deep space missions. The RP mission is in Phase-A development, which is currently maturing flight planning, requirements, and interfaces definition, while the team seeks to reduce risk and further maturing flight system designs by building “RP15.” Dubbed a “mission-in-a-year,” the RP15 prototype rover and payload system was developed in just 12 months, fully capable of prospecting, drilling, and processing materials here on Earth, similar to how RP plans to operate on the moon. RP is designed to prospect the lunar surface, create maps of the nature and distribution of volatiles, and even demonstrate processing while on the lunar surface. RP15 enables early testing of some of these important capabilities required to execute the RP flight mission. Mapping the Surface: The RP15 terrestrial rover cruised over surfaces and slopes analogous to expected lunar Polar Regions its flight counterpart will encounter. Although Earth’s force of gravity is six times greater than that of the moon, the RP15 field tests were designed to be very similar to the lunar experience. Additionally, the RP15 rover is designed to enable testing in a gravity off-load facility, enabling direct testing of rover performance in one-sixth gravity environment — just like the moon. During RP15 field testing, the Near Infrared Volatiles Spectrometer System (NIRVSS) instrument was used to sense and measure the indigenous soil and demonstrate prospecting from the rover. The RP flight system and RP15 rover include a Neutron Spectrometer System (NSS) that can sense buried hydrogen (e.g., hydrogen in the form of water) by measuring neutrons. Entering Permanent Shadows: The RP15 team introduced varying degrees of fidelity including utilizing lunar regolith simulant and doping the regolith with known volatile concentrations in order to validate the RP system could properly make relevant measurements. This type of testing could aid in understanding navigation, positioning, and measurement difficulties in a highly relevant environment. Exposing and Analyzing Subsurface Soil/Regolith: A prototype drill subsystem was included in the RP15 Payload, enabling the rover to perform actual drilling operations. This level of fidelity will enable testing procedures and methods for drilling and capturing cuttings from the drill bit. Although the RP15 terrestrial drill testing occurs in a 1g environment, valuable data was collected for constraints on the rover system while drilling on slopes, resulting in side-loading the drill bit during operations. The rover suspension system was required to compensate for loads which move during side-loaded (sloped) drilling conditions, enabling extrapolation of what might be found in the one-sixth gravity environment of the moon. 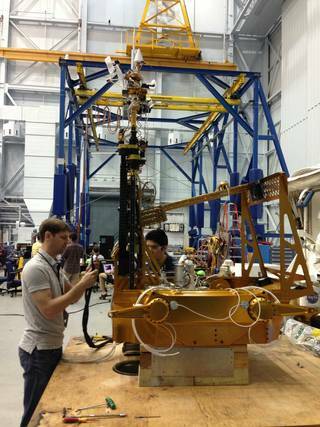 Additionally, the NIRVSS instrument measured the volatiles excavated by the drill from the soil to the surface. Capturing and Heating Soil/Regolith: The RP15 drill acquired samples from as deep as 0.75m, and delivered materials into a sample handling system. The samples were then deposited into the Oxygen and Volatile Extraction Node (OVEN), an important subsystem of the RP payload. OVEN evolves the sample’s volatiles by heating the regolith in a sealed chamber and extracting oxygen and hydrogen from the regolith sample. The OVEN heated the regolith samples to liberate the volatiles for measurement. Identifying the Volatiles: The Lunar Advanced Volatile Analysis (LAVA) is another important payload subsystem that analyzed the effluent gas/vapor from the OVEN subsystem using a gas chromatograph (GC) and mass spectrometer (MS) subsystem. Volatiles evolved from material in the doped sample tubes enabled verification of the design approaches planned for the flight RP design. The LAVA MA subsystem is designed to operate in vacuum, thus RP15 used the LAVA GC subsystem for the field testing to identify varying concentrations of water in dope simulants excavated and delivered by the drill to OVEN. In addition to the development and testing of the prototype rover and payload system capabilities, RP15 provided a unique opportunity to validate core mission operations concepts, including waypoint driving with a highly distributed team and maturing mission operation tools through actual use. Beyond the direct technical insight gained from the prototype system build and test, RP15 testing provided the opportunity for the distributed RP team to train in flight operations behavior, and to better understand the RP flight design. 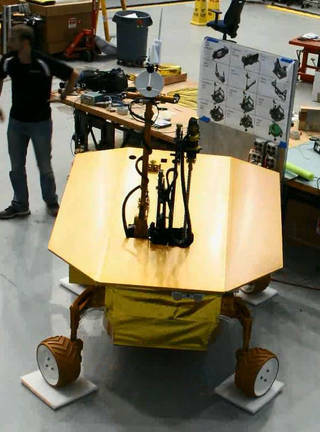 With the completion of RP15 field tests in August 2015, the RP team has conceptualized, designed, fabricated, and integrated a prototype rover system, setting the stage for extensive testing in 2016, leading up to flight.